Trump had declared a one-year "wind-down" period, which set the final expiration date of the status as March 31. But on Thursday, Trump said he had changed his mind, winning unusual praise from some immigration advocates who have fought his policies in courts during the two years of his presidency. Trump's administration has sought to eliminate similar programs for other nationalities, such as El Salvador, Haiti, Nicaragua, and Sudan. In such instances, the administration has argued that the domestic crises that resulted in those immigrants coming to the United States had long ago been resolved, and that it was therefore time for them to return home. "The Trump administration's decision to extend DED protections for Liberians is the right thing to do," said Avideh Moussavian, legislative director of the National Immigration Law Centre. 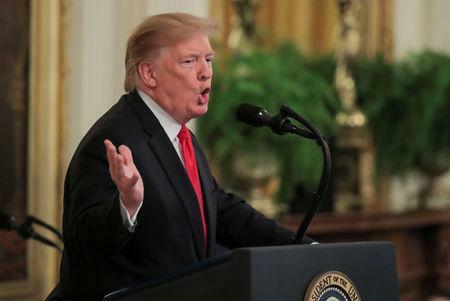 Trump noted efforts in Congress to grant Liberians permanent legal status, and said his reprieve "will preserve the status quo while the Congress considers remedial legislation." A spokesman for Liberia's embassy in the United States, Gabriel Williams, praised the announcement. "We can say without hesitation that we welcome the news very much," Williams said. "It's a manifestation of the very cordial relationship between the United States and Liberia." "We're mindful that this is only a one-year extension of the termination - not a reversal," Kassa said. Nonetheless, Trump's decision eliminates the "emergency" the Liberians were living under, said Erasmus Williams, a Liberian community leader in Minnesota, which has a large population of Liberians. "We have ample time now to work through Congress to have legislation passed that will create a pathway to citizenship for Liberians on DED," he said.